Two bedroom penthouse apartment, well furnished. Sleeps six people, with two twin beds, a double bed as well as a fold out sofa — which sleeps two persons. Superb views of the Pirin mountain from the apartment. The apartment consists of a double ensuite bedroom, a second double bedroom which has two single beds that can be made into one double bed, a lounge with double sofa bed, a kitchen area and separate shower room. Homely, family feel to this (my one and only) ski apartment – I am NOT a business! Located only 3 minutes from slopes, 7 minutes to the gondola station although there is a free minibus service, from the complex to the gondola station and return. Swimming pool, sauna, jacuzzi, steam room, games room, café, and gym are all part of the complex and available to guests at no extra charge. Ski hire/storage available just across the road from the complex. Private ski locker in complex. 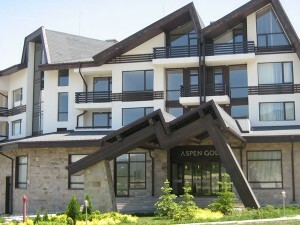 Why different from all of the other apartments in Bansko? I simply want my guests to have a wonderful time and I am happy to provide them with as much information as possible, be it from flights to transfers, ski hire to lift passes or lessons to restaurants – no question is too trivial! Prices from £250 per week. See website for prices – mybanskoskiapartment.com. Luxury apartment – sleeps up to six. Three minutes from the slopes. Look forward to hearing from you, Merv. 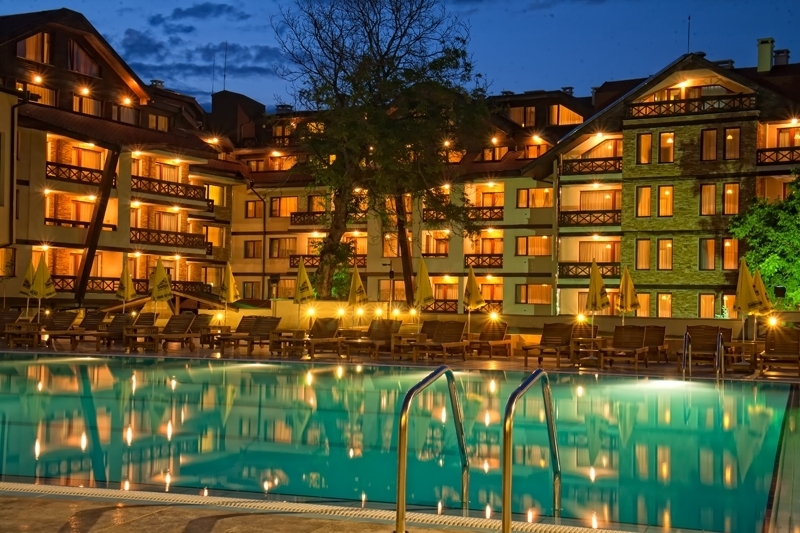 5 star Regnum Hotel Bansko; this is an all season Hotel catering for both winter sports and summer activities. 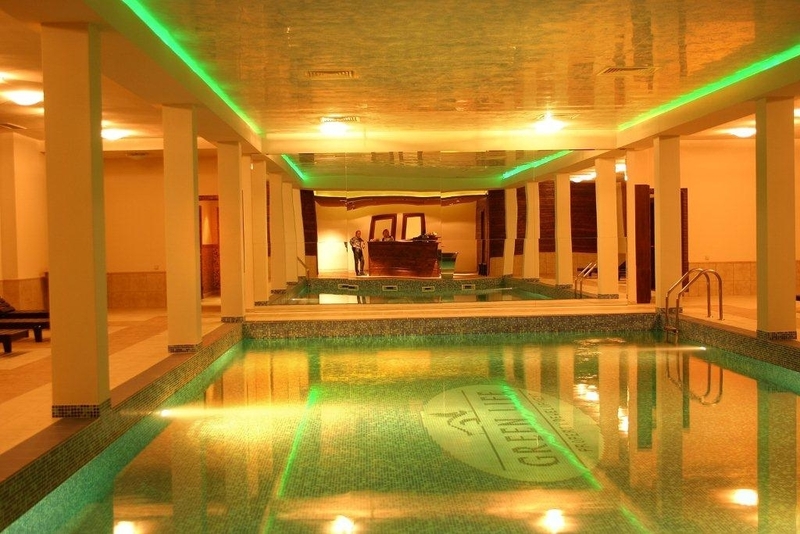 Regnum Hotel Bansko has recently been awarded a 5 star status due to it’s fantastic facilities. 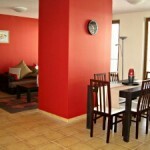 The apartment itself is furnished to a 4 star standard and this is reflected in our pricing. Prices are from £27 a night upwards. The hotel has a large amount of 5 star facilities including indoor and outdoor spa facilities and pools, there is an ice rink, restaurant and bar, shops, ski hire, hair salon, conference facilities and much more. Pirin Mountain Residence. Large one and two bedroom apartments. This example of two bed 84 sq.m (net) apartment with sofa bed. sleeps up to 6 people. Genuine 200m from the gondola. Fully equipped kitchen. WiFi internet. Located next to the large 4 Seasons Supermarket, next to ice rink, Queen’s Pub. Very close to Euphoria, Jack’s House, Lion Bar, Pirin 75, Happy End, Penguins, The Log House, Stragata and all the best apres ski. From only €29 per night — minimum stay three nights. 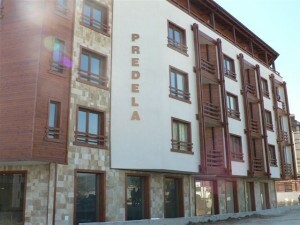 Other two and one bedroom properties available in Pirin Mountain Residence. Ideal for family holidays, both winter and summer: https://banskoblog.com/hotels/pirin-mountain-residence/ for more. Studio and one bedroom apartments also available here. Ref PR51. Predela 1. 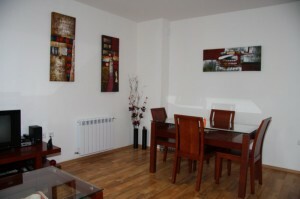 Superb Studio apartment that sleeps up to: 3 persons (Double Bed and Sofa bed). 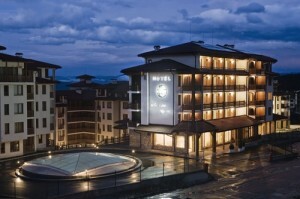 Located very close to Bansko’s premier hotel the Kempinski and the gondola lift station. 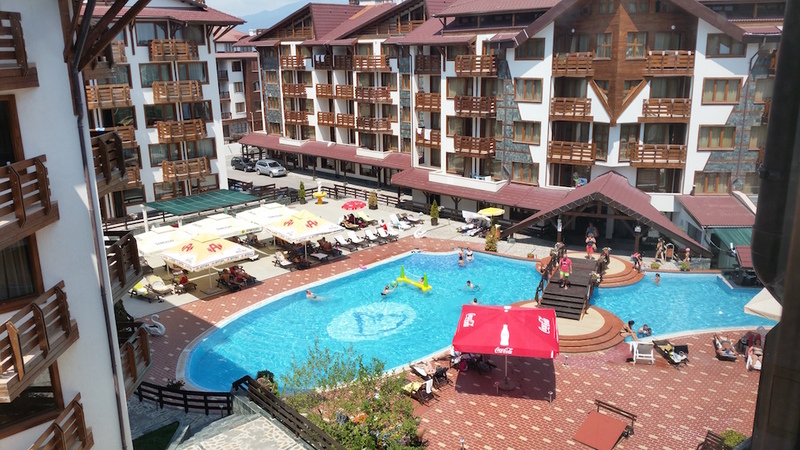 A very comfortable studio apartment with a balcony on the third floor of a top spa development in Bansko, one of the leading Balkan ski resorts. It is located about 100 meters from the gondola lift station and has full facilities and ski storage. It can sleep 3. 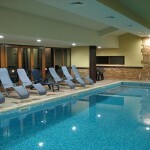 It has a full range of facilities -swimming pool, sauna, jacuzzi and gym and a cafe area. The apartment is finished to a high standard with fully fitted kitchen area and washing machine and a separate shower room. Green Life Ski & Spa Resort (formerly Paradiso Verde) GL01. 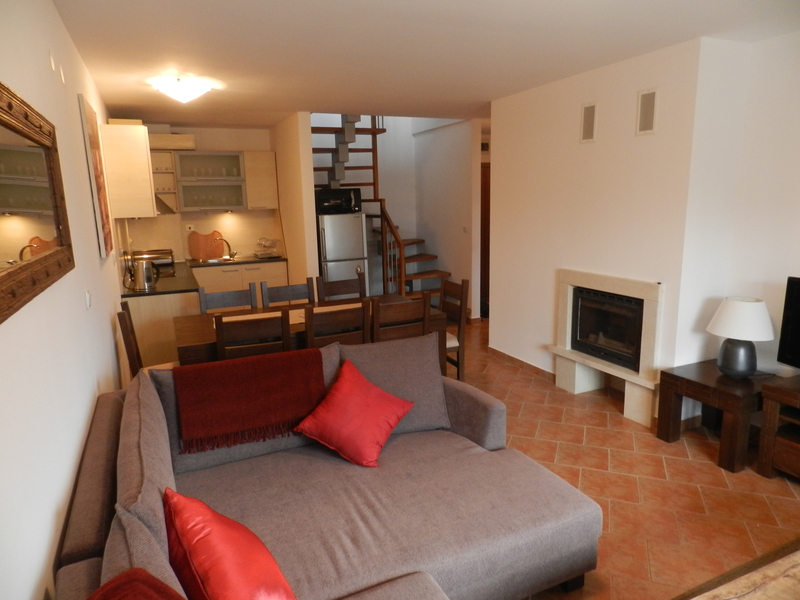 Large and cosy 44 m² STUDIO apartment, sleeps 4. 600 meters from ski lift. FREE SHUTTLE to ski lift and town centre. From €100 per week. Located 5 minute walking distance from the gondola and the ski road with excellent views of the UNESCO listed Pirin National Park. This studio apartment includes comfortable double bed, sofa bed, coffee table, TV and TV unit, double wardrobe. This stylish studio is sure to make your Bansko vacation on you will remember. 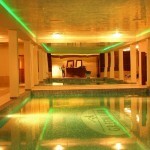 https://banskoblog.com/bansko-accommodation/green-life-ski-spa-resort/ for more info. The Monastery apartment 27 is a recently renovated apartment. Apartment 27 at the Monastery is furnished to a high level. It offers comfortable accommodation, beautiful views of the Pirin Mountains, and an easy five minute walk from the ski gondola. There are supermarkets, restaurants, bars and pubs within a few moments walks of the apartment. It has two double bedrooms, 1 bathroom with toilet and shower, and a bathroom with a separate toilet. It has a ski rack for skis and boots, flat screen TV (with cable), wifi, ipod dock, modernised kitchen with all amenities, including washing machine. A log fireplace to warm you on the winter nights. Prespa (PSP01): Our luxury three bedroom penthouse apartment is in the Prespa complex in Bansko with sleeping for up to nine people. The apartment is only five minutes walk from the main gondola station, ten minutes walk from the town centre and has a variety of bars, dining and spa options on its doorstep. For prices and availability please see www.banskoluxurypenthouse.co.uk or e-mail mail@banskoluxurypenthouse.co.uk. Ref TL1, TopLodge: This superb well positioned 1 Bedroom apartment in Top Lodge is located midway between the Ski Gondola and the Old Town just 5 min walk to each. Full use from £24 per night. The complex facilities are free to my guests and include Pool, Sauna, Turkish Steam room, full gym, table tennis, bar football and BBQ area. 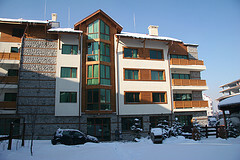 The free https://banskoblog.com/bansko-accommodation/top-lodge/ for more. Ref KRB4 and Ref KRB11 . Kandahar. 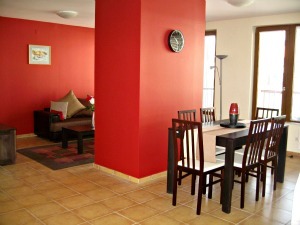 Luxury studio and one bedroom apartment to rent in Kandahar block 150m from gondola . Each apartment sleeps up to 3 adults or a family of 4 and comes with all mod-cons including TV and DVD, fitted kitchen and bathroom with bath and shower. Between the two apartments (a studio and a one-bedroom), we can accommodate up to 8 people. MVA05. Mountain View Resort. Onebedroom apartment. 60 sq.m Situated on Pirin Street, just up from the Kempinski Hotel and less than 5 minutes walk from the gondola station. No expense has been spared when furnishing our larger than averageÂ One Bed Apartment (Living area of 60 sq.m) as you can see from the photos. Mountain View is a genuine 400 m from the gondola!! Ref : MVR B24. Mountain View Resort. One bedroom apartment. 58 sq.m NET. Situated on Pirin Street, 200m from the Kempinski Hotel and less than 5 minutes walk from the gondola station. Ref AGG003: Aspen Golf. Two bedroom studio apartment block G number G003 situated in the Aspen Golf Complex, ground floor with outside terrace, bathroom, kitchen, and bedroom facilities. The complex has a gym, indoor and outdoor pool and spa. There is free internet access based in a communal area.Â A bar and restaurant for use on site. Regular free transport provided by the resort to/from the base of the Gondola for the winter season. Ref AG420: Aspen Golf. 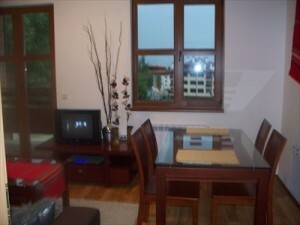 This naturally lit one bedroom apartment is spacious (50 m2) with spectacular views over the Rila Mountains. Ref:MDG15: Mountain Dream. One bedroom luxury apartment (G15) which is part of Mountain Dream, a ski hotel in Bansko Bulgaria. The hotel is five minutes walk from the state of the art gondola station, with the hotel offering a ski in ski out facility, it is ideal for the skier but will also make a wonderful base for those wishing to enjoy the winter sights in and around Bansko. See map for the the location of the hotel and ski station. The old town of Bansko is only a 20 minute walk from the hotel or a short shuttle bus journey. https://banskoblog.com/bansko-accommodation/mountain-dream-ref-mdg15/ for more. intenet access,satelite T.V. and a DVD player in the lounge. The apartment is 5 minutes walk into the village for restaurants and bars etc, and 10 minuteswalk from the Gondola ski station. A shuttle bus runs regularly from the complex. Our prices are competitive and are per night not per person. 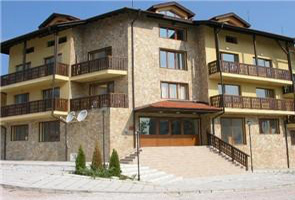 Are You A PROPERTY OWNER In Bansko? Are looking for some extra rental income? Are you looking to make some extra money from your property? Considered renting? This site receives over 14,000+ targeted visits (10,000+ unique visitors) per month in ski season (40,000 approx page views). A maximum of fifteen apartments are shown for rental. Stand out from the crowd. Over 180,000 visits per year. All advertisers can link to own property web site or other ad. Tips on how to rent and maximise your Bansko rental income sent to all advertisers. NOTE: BanskoBlog is unable to take responsibility or liability of the accuracy of the information on these pages or your rental. 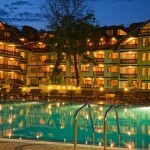 Bansko Blog lists property on behalf of owners. The owners and their agents are responsible for collecting all relevant resort taxes (currently around 2 levs per night per person).